The IKEA story began in 1943 in the small village of Agunnaryd in Sweden, when founder Ingvar Kamprad was just 17. Since then, the IKEA Group has grown into a major retail experience with 123,000 co-workers in 25 countries/territories generating annual sales of more than 21.5 billion euros. Today, the IKEA Group can be considered one of the most successful companies in the world. Apart from generating more than 21.5 billion Euros in 2009, many facts and figures emphasize the organization’s success over the last 69 years (cf. Appendix). For instance, the IKEA Group now comprises 267 stores in 25 countries, with 1,220 suppliers from all over the world and constantly growing sales – even in times of difficult economic situations (like the late-2000s financial crisis). But what exactly is the secret of IKEA’s success? How does the Scandinavian home goods company sell so much more to its customers in comparison to its competitors? And why do people even use phrases like “shopping experience” when relating to their time spent in one of IKEA’s retail stores? In behavioural economics, many experiments have been conducted to find out about psychological factors influencing consumer behaviour and buying decisions. The results of these experiments, which have taken into account aspects like store design, pricing strategies or demographic differences, provide companies with many suggestions for the sake of increasing sales. 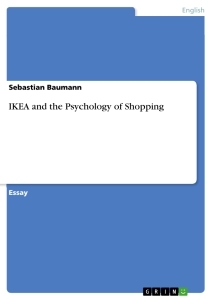 In order to analyse IKEA’s success, this essay will first present key aspects concerning the “psychology of shopping”. Afterwards, these findings will be applied to the IKEA Group and specific parts of its retail stores. Moreover, the so-called “IKEA Effect” will be explained in the context of psychological biases. The probability of selling an item does not only depend on factors like brand awareness or pricing strategies. Although marketing and advertising can have a great impact on a customer’s purchasing decisions, there are many psychological aspects that heavily influence consumer behaviour. Paco Underhill, founder of a New York-based behavioural research and consultancy, has analysed these aspects with a group of retail researchers. In his first book “Why We Buy: The Science of Shopping” he provides a lot of interesting findings concerning the psychology of shopping. In order to determine the success of a store in selling goods, Underhill comes up with various means of measurement. First of all, he refers to the term conversion rate, which represents the percentage of shoppers who become buyers (cf. Underhill, 2000: 34-36). This percentage can be influenced by many factors and conversion rates often vary between different sections of a store (e.g. conversion rates of toilet paper or dairy are usually around 100 percent), but there are still certain strategies that have to be taken into account in order to convert shoppers into buyers and thus maximise sales. One import finding of Underhill and his team of researchers relates to the time people spend in a store (cf. ibid. : 36-37). Simply put, they state that the more time a shopper spends in a shop the more likely it is that he or she will buy something. For example, research in an electronics store has shown that nonbuyers spent 5 minutes, 6 seconds in the store whereas buyers stayed for 9 minutes and 29 seconds. In other stores, “buyers spent three or four times as much time as nonbuyers” (ibid.). The time spent in a shop can have the greatest influence on the amount of purchases, but there are still other things to pay attention to. One further way to judge a store is by its interception rate (cf. ibid. : 37-38). This measure puts a focus on the relationship between the amount of customer-employee contact and sales. Here, Underhill mentions that “the more shopper-employee contacts […] take place, the greater the average sale.” (ibid. : 37). Therefore, customers should be taken care of as much as possible to avoid feelings of frustration or confusion and to increase sales. Underhill’s last measure refers to waiting time (cf. ibid. : 38). Retailers who want to make a contribution to customer satisfaction have to be aware of the fact that long checkout lines usually annoy customers and sometimes even make them leave the shop without buying anything. What makes a brand authentic? The example of "The Body Shop"
Online Second-Hand Shopping. Threat or Opportunity for Branded Products? Shopping at www.libri.de - What keeps me there, what makes me leave?